Every year at BookExpo, the annual publishing industry trade show, there are a few books that generate an almost audible buzz around the packed convention floor. This year, one of those was a young adult horror book called Blood and Salt, by first-time novelist Kim Liggett. Blood and Salt—the buzz for which continued well past BookExpo, including high-profile mentions in places like Entertainment Weekly—is a complex, beautifully-crafted book mixing horror, romance, history, and a coming-of-age story, released by G. P. Putnam’s Sons in September. It centers on Ash Larkin, a seventeen-year-old New Yorker who tries to rescue her mother from a cult hidden in a Kansas corn field, and the antagonist is Coronado, who in real life led an expedition to Kansas in search of a city of gold. 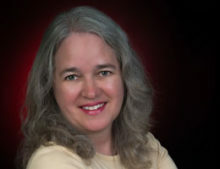 Liggett, who in the past has worked as a singer, spent years working on the book, and has already written the follow-up. She lives in New York with her husband and two children. You sound like you’ve had some interesting careers in the past—back-up singer, actress, entrepreneur. Have you always written? This is the first book I’ve ever written—the first anything I’ve ever written. I’m dyslexic, so reading didn’t come easy for me. I learned how to write in order to tell this story. Overcoming dyslexia to write? How did you do that? The short answer is acceptance and perseverance. First, I read everything I could get my hands on. I may have read it wrong or misinterpreted the material at times, but I learned to let that go. You don’t have to be a perfect reader to enjoy books. There are certain grammar rules that I’m never going to fully grasp and that’s okay. And the most important element is that I’m incredibly stubborn. If there’s something I really want, I’ll find a way to make it happen. Okay, we’ve got to know: who are some of the bands you sang back-up for? I was a studio musician in the 80’s—I worked on everything from punk to country. It was a crazy time. Since you’ve got two teens of your own, did you read a lot of young adult fiction and become inspired by it? Absolutely! I wanted to see what all the fuss was about. I got completely addicted to the pacing in YA. Were you very conscious of wanting to use that pacing in Blood and Salt? How did you go about that? I have a low boredom threshold, which helps. I’m really into the economy of words. I’ll take a gutting three-word sentence over a flowery one-page description any day of the week. When did you start work on Blood and Salt? I started thinking about the story about ten years ago, but didn’t fully commit until about five years ago. It took me a year to write the first draft, another year to revise it for submission, two years of revision with my editor, and another year in the cooker at Penguin. Such a long process. How did you decide your book was finally ready for submission? Did you make use of beta readers? I did. But towards the end, I had to rely on my inner voice. I knew I’d put in the work. I’d agonized over every word. I was able to let go of the manuscript knowing that I’d done the best work I could possibly do on my own. It was extremely gratifying to have such a strong and immediate response from agents and editors. I knew I was on to something good. Blood and Salt’s protagonist, Ash, has a little bit of the wild child about her, and that phrase also appears in your biography. How much of Ash comes from you? A bit. I’m a rebel at heart, but Ash is based on my daughter, Maddie. I originally wrote the first few chapters of Blood and Salt as a love letter to my daughter. She had her first crushing love and I wanted to show her how brave, smart and fascinating I thought she was. How did you choose the real conquistador Coronado for your villain? That was a no-brainer. I grew up in a tiny town in Kansas, entrenched in the legend of Coronado. He came to Kansas in 1541 searching for Quivira—the land of gold. There’s an interesting and very sympathetic thread involving Native Americans running just under the surface of Blood and Salt. What was the genesis of that? While the rest of my hometown glorified Coronado’s expedition, I always saw it as the beginning of the end for the Quivira tribe. A tragedy. How much research did you do for Blood and Salt? Years and years of research, much of which I never had the opportunity to use, but it was vital to the process. I delved into alchemy, sacred geography, the Quivira and their language—I even got a chance to read a transcript of Coronado’s journal from the expedition. The truth is more fantastic than anything I could ever come up with. Much of the plot hinges on Katia Larkin, a 16th-century alchemist who found the secret of immortality. I wondered how you came up with that name, since it seems to mix European and English, and yet Katia also seems to have ties to Spain . . . I didn’t want her to be from anywhere specific. I wanted her to be a woman of the world and I wanted her name to reflect that. She was the most fun to write. I’d love to write a prequel just about Katia and how she came to be immortal. I know that many of your readers—including me!—would love to read that prequel. Can you see yourself writing about Blood and Salt’s characters and world for many years, or do you think you’ll soon be anxious to tell new stories? I’m already anxious to tell new stories! The prequel is definitely on my list, but that would probably have to be more of an adult book. The use of scent fills the novel from beginning to end, with the protagonist often identifying other characters by their smells. Why did you decide to focus on scent rather than other senses? I’ve always been fascinated with perfume, which has its roots in alchemy. It was a natural marriage. I developed a fragrance for each character and each location in the book. It was a captivating way to experience these characters. Blood and Salt is surprisingly complex, with a wealth of characters, a large cult that has its own rituals and systems, and a backstory that spans five centuries. Did you ever have a hard time keeping track of it all? YES! I ended up carrying around a giant piece of poster board with me at all times, with the components for each scene on tiny post-it notes. I moved them around endlessly, like a crazy person. The five different families of Quivira, who come complete with their own architectural styles, reminded me a little of the Hogwarts “houses” in the Harry Potter books. Are different houses or families becoming a trope in young adult fiction? I can’t speak for the genre as a whole, but for me, I grew up in a community with very distinct neighborhoods—East, West, North, and South. I wanted to find a way to differentiate the families and still stay true to the original inspiration. Blood and Salt opens with the image of a dead girl hung upside-down above a kitchen table, her blood dripping into a cereal bowl that an oblivious boy is eating from. It’s a great mix of the horrifying and mundane, and is later contrasted by scenes of big supernatural fantasy. Do you enjoy writing both types of horror equally? And did you set out to deliberately contrast the everyday with the cosmic? It’s one of my favorite aspects of this book, combining the supernatural with the mundane. And I find there’s a natural sweet spot for some surprising levity and humor in those moments. Both the horror scenes (some of which are wincingly gruesome!) and the eroticism in Blood and Salt are fairly intense. Did you ever have to pull back on either of those elements, given that the book was a young adult novel? I’m constantly having to pull back. It can get really frustrating. I think there’s a huge rift between what teens are watching on TV and what they’re allowed to read. I will forever be pushing the boundaries. Do those limitations make you think you’d like to try an adult horror novel one day? I’d love to write an adult horror book someday, but I’m really drawn to the teen years. I mean let’s face it, is there anything more horrifying than high school? In the Acknowledgements for Blood and Salt, you say that the book has brought you “the most unexpected career.” Can you talk more about that? I never thought I would be a writer. I never thought I could be a writer. And now I have four books under contract and more in the works. It’s a beautiful thing. Do you now see writing as being your permanent career? I don’t see anything as being permanent. I will always write, that much I know. Whether it’s for publication or not is another matter. The buzz around Blood and Salt has been massive, and you seem to enjoy meeting fans and working with social media. Is that a skill you already possessed? How important do you think mastering social media is to a writer’s career these days? I’m not sure. I do it because I enjoy it. I wasn’t on social media until I started writing. It was a great way to meet other writers and learn about the industry. What was the single most important thing you learned? Keep writing. Don’t get too bogged down in the business end of things. The best thing you can do for yourself is to write your next best thing. You’ve called Blood and Salt a “duology”—is the second volume already finished? We’re in the editing phase right now with book two. Any movie buzz yet (at least that you can talk about)? Lots of buzz, but nothing concrete yet. Fingers crossed. I’d love to see this story on the big screen. Would you ever want to try writing a screenplay version of Blood and Salt? I think I might. I just signed up for my first screenwriting class last week. You’ve mentioned some darker horror novels you have forthcoming from Tor. Can you tell us anything about those yet? The first one is titled The Last Harvest. Pitched as Friday Night Lights meets Rosemary’s Baby, it’s the story of 17-year-old former football star Clay Tate, who, as the one-year anniversary of a horrific slaughter approaches, is forced to come to terms with his family’s—and his rural Oklahoma town’s—role in a plot to deliver Satan back to earth. You recently spent some time in rural Spain. Did that inspire you to explore some new territory in your fiction? I was so inspired. There will be lots of amazing tidbits surfacing from this trip in Blood and Salt book two, but I also started working on a brand new book that I’m extremely excited about. Stay tuned . . .
Have you written any shorter fiction? Do you want to? I’d love to. I feel like I’m just getting started. Have your kids read Blood and Salt? Of course. My daughter cried for days. My son thought it was a little racy, but other than that— all thumbs up.